Do you REALLY know what is in the makeup that you are using on your face everyday? I’m assuming that the title of this post caught your attention, and it should! Is your makeup contaminated? I came across a news broadcast that was truly disturbing and it’s time to talk about this and spread the word! Ask yourself: Do you REALLY know what is in the makeup that you are using on your face everyday? Where did you purchase your makeup? Is it from Amazon or Ebay? Or is it from an authorized source? And wherever you are buying it from, do you know what kind of quality control and testing it goes through before it ends up on the shelf? Are your cosmetics really the brand you think you’re buying? On April 12, the LAPD raided 21 locations and seized an estimated $700,000 worth of counterfeit cosmetics containing bacteria and human waste. 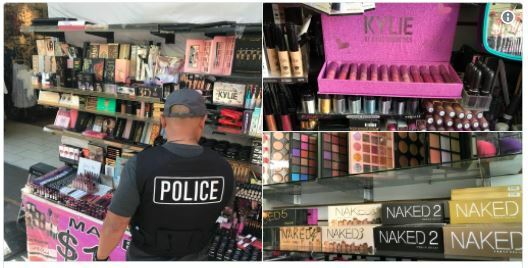 Captain Marc Reina tweeted about the incident, with photos of the makeup stands selling fakes of Kylie Cosmetics, Huda Beauty, M.A.C, Urban Decay, and Tarte. And at least six people were arrested on suspicious of trademark violations. The investigation started after customers called the actual cosmetic companies complaining of bumps and rashes from the products. When customers revealed they bought the products in Santee Alley, the Anti-Piracy Unit swooped in doing undercover buys to test the products. “They came back positive with a high level of bacterias and animal feces,” LAPD Detective Ishitani said. He added that legitimate cosmetic companies adhere to health and safety standards, which is costly. As for the bogus products, they are made where contaminants are rampant. “Those feces will just basically somehow get mixed into the product they’re manufacturing in their garage or in their bathroom – wherever they’re manufacturing this stuff,” he said. Do you think you can tell whether or not you have legitimate cosmetics? The issue is that the packaging can be identical to some of the luxury brands and it very difficult to know if it is the real thing or not. Purchase makeup from the store? Now what if you buy makeup from a legitimate store? I saw an article in December announcing the international retailer Claire’s Stores Inc. took nine makeup products off the shelves following a report that tremolite asbestos was found in the makeup. Asbestos is a commercial name given to a cluster of six minerals that occur naturally in the environment. If swallowed or inhaled, tremolite asbestos can lead to lung damage and cancer, including mesothelioma, an aggressive and deadly form of cancer. In a statement, Claire’s said initial testing found the cosmetics to be asbestos-free, but that “out of an abundance of caution, additional testing is underway.” In recent articles, Claire’s is stating that they have completed the additional testing and claims that the makeup is safe, but with more research, I am personally concerned. This all started when a Rhode Island mother was the first to report the potential problem after she saw her daughter playing with a makeup kit from Claire’s. Kristi Warner decided to have it tested for asbestos, according to Sean Fitzgerald of the Scientific Analytical Institute, which specializes in testing for toxic substances. She had just been taught about the dangers of asbestos and talc and decided to have it tested. Seventeen different products were purchased in nine different cities within a two-week period, Fitzgerald said, except for one makeup kit that was “purchased several years ago.” He said in a letter to the law firm that he found asbestos in 24 talc-based makeup items from those 17 kits, including eye shadows, blushes and compact powders. The kit purchased several years ago was one of those that tested positive, he said. Asbestos becomes dangerous when particles or fibers enter the lungs or stomach. At that point, experts say, no level of asbestos is considered safe. The Occupational Safety and Health Administration has established standards, depending on the type of workplace exposure, but generally sets permissible exposure limits at 1.0 asbestos fibers per cubic centimeter over a 30-minute period. 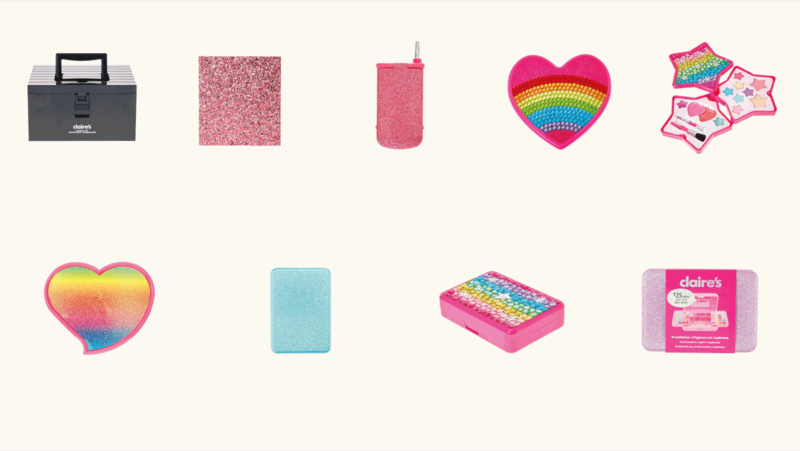 At Claire’s, customer safety is of paramount concern, and we pride ourselves in providing our customers with quality products that we stand by, so we wish to address a recent report that cosmetics sold by Claire’s may contain asbestos. We want to assure our customers that all of our products are safe and asbestos-free. Claire’s categorically denies that the testing by STAT, relied upon by PIRG, is accurate. The test methods that were used by STAT are obsolete and unreliable, and STAT is not certified to perform the type of testing necessary for talc-based products. In contrast, Claire’s has conducted extensive testing and investigation in cooperation with relevant authorities, including the FDA, Health Canada, and a number of EU enforcement agencies, to demonstrate that Claire’s products are asbestos-free and comply with all relevant safety regulations. Indeed, testing by an independent laboratory of fifteen samples confirms that the products tested by STAT are asbestos-free. In addition, testing of more than 85 samples using the most up to date test methods has been conducted by independent laboratories both in the USA and Europe. In addition, several cosmetic products sold by Claire’s have been tested by Health Canada and the Dutch Human Environment and Transport Inspectorate (ILT). This extensive testing conducted by four separate laboratories has confirmed that these cosmetics products do not contain asbestos. In addition, all our powder-based cosmetics use the same base formulation, utilizing Merck certified asbestos-free talc, which is the same talc used in other well-known cosmetic brands. But the scientist from the lab that said it found asbestos in the makeup products continues to question the company’s procedures. “They have not retested the same products,” said Sean Fitzgerald, director of the Scientific Analytical Institute, a North Carolina lab that specializes in testing for toxic substances. Fitzgerald’s lab did the original testing of 17 Claire’s makeup kits at the request of a client. It found asbestos in 24 talc-based makeup items, including eye shadows, blushes and compact powders. Just be aware…and you can rest assured that the cosmetics that I promote and any retail from my website has the best quality control that you could ask for. It is very important to me, as well as my clients. Just in case you missed my Facebook LIVE video, you can watch it below! !